This summer, 16 institutions across K-12 and higher education will receive furniture, design, installation and on-site training for a new active learning classroom, thanks to Steelcase Education's fourth annual Active Learning Center Grant. Valued at about $67,000 per classroom, the grant "supports active learning strategies in classrooms where teachers are already striving to implement related practices by installing a learning space with furniture designed to encourage student engagement and success," according to a news announcement. The institutions have a variety of plans for the grant, from converting a library space to training teachers to implement active learning in their own classrooms. All the projects demonstrated "a commitment to innovation and improving student outcomes," the announcement said. "Our grant recipients come from school districts and regions across North America, demonstrating that active learning and personalized teaching methods are top of mind for all educators today," said Craig Wilson, director of market development for Steelcase Education, in a statement. "We chose to partner with each of these institutions because of their commitment to evolving pedagogy, innovative learning and student success." In addition, the grant recipients will conduct research on the impact of the new learning spaces and have the opportunity to share their experiences and best practices in an annual symposium. "We are excited to learn from these innovative and enthusiastic teachers and faculty members," said Marisa Sergnese, training and professional development leader at Steelcase Education, in a statement. "As we share with instructors best practices for incorporating the active learning environment into their curriculum, their insights will also inform our research, future products and strategic development to better the educational experience." 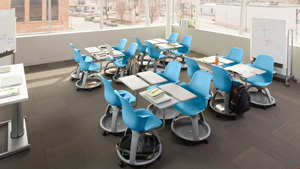 For more information on the Active Learning Center Grant, visit the Steelcase Education site.